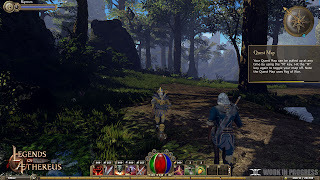 ThreeGates today announced that Legends of Aethereus, an indie action RPG with up to four player co-op and a variety of PvP game types, has now released its full Multiplayer Beta. The game has been in development since 2011 and had a successful Kickstarter in July 2012. Legends of Aethereus has entered its pre-launch polish phase as the game prepares to launch in the coming months. The title is currently a Steam Greenlight candidate and is looking at digital distribution platforms to bring the game directly to Windows PC, Linux and Mac players. The new Legends of Aethereus multiplayer beta is available for Windows, Mac and Linux. As a member of the Nexus City-State, one of the last bastions of freedom and hope on Aethereus, you will be entrusted with the critical undertaking of procuring the The Ancient Skyfall Relics. Standing in your way are the Serpentica Shamans of Ghalia and the hordes of Khagal Tribes they control as well as the oppressive Venatan Empire forces led by the notorious General Zhorgal. Join forces in online multiplayer cooperative expeditions as the Inventor or Officer while you embark on a variety of story driven hand-crafted expedition levels and explore the wilderness through a variety of procedurally generated exploration quests. Design and build new gear and weapons while you develop your character across a diverse and expansive skill tree allowing for a multitude of character strategies. • Physics-based combat system focused on player control including realistic Shock Force calculations to scatter your enemies. Whether it is from massive explosions or monstrous melee strikes, they are going to fly!